I wasn't sure how much new material I will find in this book so I started it hesitantly. At the end, I was left with both amazement and a bit of disbelief. I definitely saw Genghis Khan, and specially the Mongol culture, as being far more prominent in our lives now 750 years after than I previously understood. 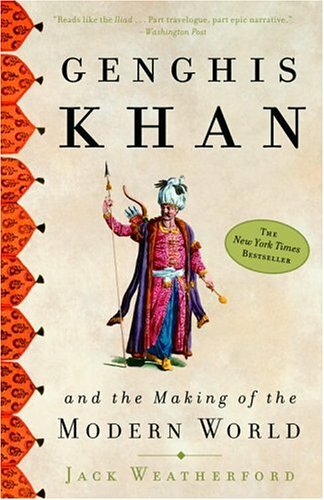 However, some of the progressive ideas attributed to the Khan in the book either seemed misplaced (like was he "tolerant" towards other religious or simply didn't consider them important enough to bother with them) or really need to be attributed to his descendants, specially to Kublai Khan, who really comes across as the administrative kind. However, it is clear that his image has all been tarnished out of history by the Europeans and his recent resurgence as the most amazing military general and a conquerer of unparalleled success only seem to set the record straight. I recommend this book. While definitely not the best written book or the most convincing, it is definitely aimed at dissemination of the right kind of information.